This engaging and thought-provoking exhibition is composed of more than 70 objects—paintings, sculptures, photographs, and multi-media installations—created by many of the most important African American artists working over the last 30 years. 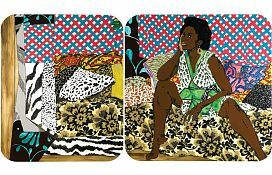 The artists range from well- known, established figures such as Jean-Michel Basquiat, Kerry James Marshall, and Carrie Mae Weems to emerging younger ones like Kehinde Wiley, Hank Willis Thomas, and Mickalene Thomas. Seen together, 30 Americans provides an opportunity to examine the various relationships between these artists and, ultimately, to experience a cross generational exploration of the influence of race, sexuality, history, gender, and popular culture on individual identity. 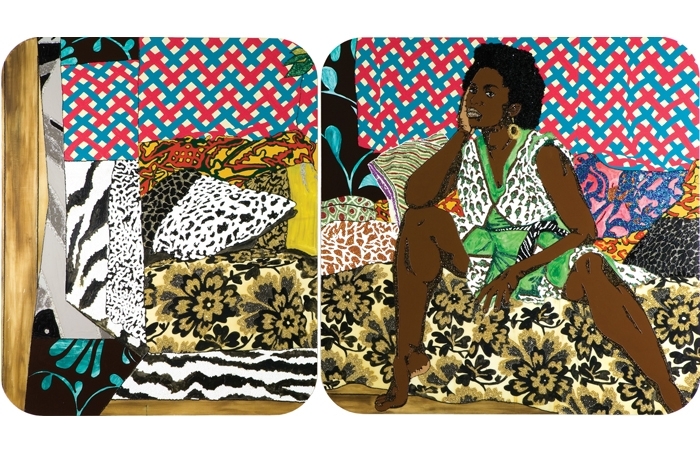 For example, Weems and the late Robert Colescott often critique the denigrated place (or entire lack thereof) of African Americans in art history, a position re-challenged in the recent grand portraits of Kehinde Wiley who bestows a sense of dignity and power to his sitters while maintaining their urban identity (right). Wiley has also been influenced by the realistic and culturally expressive depictions of African Americans by Barkley Hendricks (below, left). Like Hendricks’s, Wiley’s subjects are not generic types but recognizable individuals. Other significant artists in the exhibition include Kara Walker, whose black cut-paper silhouettes initially appear to be benign antebellum tableaux before a closer look reveals a narrative fraught with slavery, racism, and sexism, and Glenn Ligon, who borrows material from a wide array of sources, from Gertrude Stein to James Baldwin to Richard Pryor in his text-based work. Ligon’s flickering neon sculpture America was inspired by the opening lines, “It was the best of times, it was the worst of times . . .” in Charles Dickens’s novel A Tale of Two Cities and is meant to represent the duality of a country that had elected its first African American president in 2008, the year the work was made, yet was engaged in two controversial wars and was entering a deep recession. As the show evolved, we decided to call it 30 Americans. “Americans,” rather than “African Americans” or “Black Americans,” because nationality is a statement of fact, while racial identity is a question each artist answers in his or her own way, or not at all. And the number 30 because we acknowledge…that this show does not include everyone who could be in it.